If you're not very familliar with art materials you might be thinking to yourself " 'White-out?' Doesn't he mean 'Wite-out?' "
Wite out is the horrible, foul smelling goop made by Bic for making small corrections to typing and letters. It's not archival, isn't terribly opaque, bleeds and isn't easy to draw over. 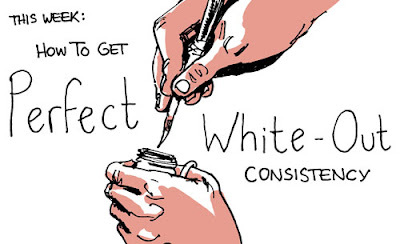 WHITE-out is another word we cartoonists use for what is really a specialized guache for correcting ink drawings. It's super-opaque, has very high quality pigment, is archival, and when applied at the right thickness can be drawn over almost (though not quite) as well as paper. A third alternative would be a tube of good guache. Regarding the lid to the jar of Pro White! lid? what lid? Don’t even bother putting the lid back on. I haven’t seen my lid for years! you don’t need it. 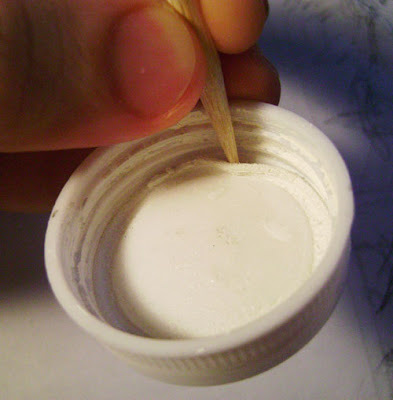 Use a spray bottle to wet the top when you want to start melting it down for your purposes. You have more control over it that way. 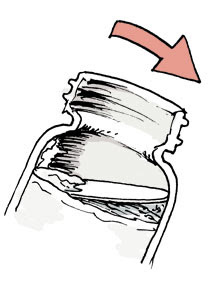 I keep a thin layer of water constantly in my white-out bottle. I DO NOT MIX IT IN. I simply let is sit on the surface. The effect is quite interesting: When I tried it I was sure it would just soak in, leaving me with a jar of thinner white-out. But it didn't- It forms this fairly complex little multi-layer whiteout ecosystem, like a little atmosphere/ocean/seabed type thing. Layer 1 is the surface of the water, which is actually opaque white, but I'm drawing it as if it were translucent. Layer 2 is the murky white water itself. Later 3 is the damp sea bed, so to speak. There is a thin layer that soaks ion the water and gets wet, but the soaking remains confined to just this thin, wispy layer. Layer 4 is the constant, perfect layer of ready-to-use thickness white-out this method creates. Layer 5 is the white-out underneath, which is either just right also or slightly too thick, depending on what you started with when you added the water. To use the white-out, tilt the bottle. The water will run off immediately, but the too-thin layer 3 will remain and run down more slowly, taking 3-10 seconds to follow. The great thing about this method is no holes in the whiteout. The water layer smooths everything back flat as it sits. And the 4th layer is just right, thin enough that you can apply three or four coats before it starts to glop up, but opaque enough that one brush stroke is all you need for totally opaque coverage. 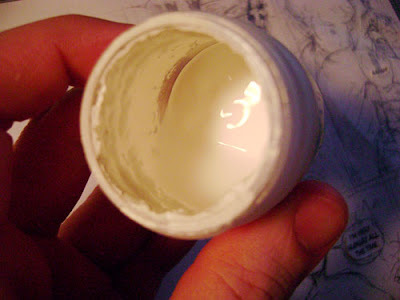 It has a nasty habit of falling out, but that's easily fixed by gluing or taping it into the cap. This makes the bottle watertight as it was before you opened it, and hold in all that moisture. Very well illustrated and useful tip. Thanks. These are the kinds of minutiae that you either learn independently over years of experimentation or never learn at all. Somewhere down the line you should compile them in a book, I reckon, this stuff is gold. Just found your blog. I love it. Thanks for all the tips! Love this blog. For myself, I prefer a good tube of white Winsor Newton gouache paint to Pro White. It has a fine pigment load and is so INTENSE that if you try to mix it with cheaper brands of gouache when working on a painting, you might as well forget about it. It's that overpowering, that flat, that terrific. Again, great blog - I look forward to each and every post. I've got a bottle of the Deleter stuff. I was hoping I'd be able to use it in my nib pens, but it seems too thick. Any advice? Bobby and Simone- thank you both! Alec- I'm always especially excited when I post something good enough to prompt you to comment. I hope it makes you make the wonderful comics you make better. Hugo- I never liked the stark whiteness of the guache on my often slightly off-white paper, but Guache is a wonderful thing, no doubt. Even better, it comes in a tube so it never dries out. But then, it's so problem-free it doesn't really warrant any special explanation from me. Joe- white-out can't flow from a pen and still be opaque. I've tried so-called "white inks" and found them all lacking. If you want to use white with a nib, unless someone knows something I don't, you're still fucked with technology in it's current state. Thanks - very interesting. Will definitely give this method a go. Thanks for your comment above about gouache, Matt. I made the switch from Pro White to Winsor Newton white gouache in a college art class. The Pro White had a yellow-ish cast to it on my bristol board that made it obvious that it was a correction. The gouache didn't do that for me. It was more invisible on the paper. Now, that was just MY experience with my own materials. In the end, people should do what works for them. 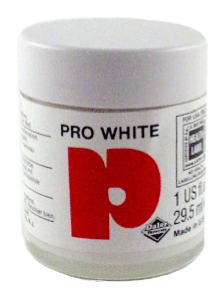 I use the Pro White and have discovered over the course of the week that this suggestion is EXACTLY what I've been needing for this stuff to work. While I've added water and let it sit in the past like you suggest, it all dried out so quickly that I didn't get the point of maintaining that top layer of water. Now, I make sure to check my bottle every day and add a few drops if needed, especially since I don't have the liner anymore and it dries out faster. It wastes less whiteout by my no longer having to mix and it goes on SUPER smooth onto the paper now. It's beautiful. :) And I've found the longer I'm letting the water sit, the deeper it goes and the more usable white out I have to work with immediately without having to mix or wait. 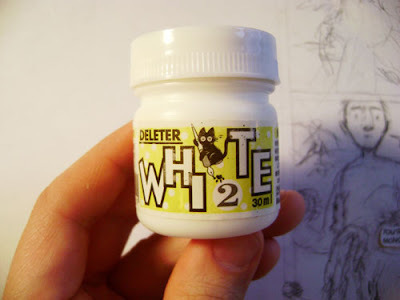 BTW: The Deleter white out is proving rather difficult to find both locally and online, but I think the Pro White works just fine with this method. It's not nearly as clumpy or over thin like it used to be and is perfectly opaque. I'll be sure to try out the Deleter white out if I do manage to run across it locally in the future though. I used to use the Deleter, but I was given a couple of bottles of Maxon white comic ink (I know, the very idea of using anything that says "comic" on it seems like a red flag), and I love it. It's thick - you do have to add water - but it goes on smooth and opaque, and I've yet to see much of an aging problem. If you're doing Heroes again this year, I'll bring a bottle for you to try out. Great post, as usual! Thanks. Chris: Where did you come across this stuff? It took me forever to find online, and none of the major art stores, not even New York Central, seems to carry it. I'll post the link to where I foind one could purchase it next week along with your comment, thanks! I know everyone thinks white out pens are terrible, BUT the Pentel Presto! pen is actually pretty good if you're feelin lazy and want to do a quick n easy correction. Dov- The product doesn't indicate that it's archival, which is an issue for me, at least, as I sell original art. If that's not an issue, though, it looks like a good product. I stumbled on this blog after searching Google on whether I can water down Deleter. This is great, thanks for the tip! My Deleter is practically glue at this point. Hopefully I can mix in a little water prior to using the water-on-top method. I've used white FW Acrylic Ink in the past, but lately it's been requiring several layers and/or turning my black to gray, which is maddening. I want to go back to Pro White or Deleter, but this will help a lot. Thanks! 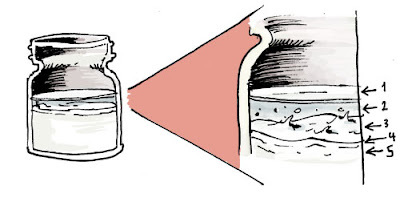 Great info on keeping a jar of correction fluid moist - thanks! I have a question about the correction fluid pens. Does anyone know what to do when the plug is cemented and the little ball won't roll any of the liquid out? I have thrown away so many almost-full "pens". Any tips (pardon the pun)? I've never heard of any correction pens that are archival, so I don't know a thing about them. Anybody? My pro white got mold growing on after doing this. I got rid of the mold by removing it physically and then rinsing with rubbing alcohol a couple times. but the next time I put clean water in, mold grew again. Is there a way to avoid the mold? Never had the mold. How curious. Man this blog is so awesome. You are great. I love this so much. I live in Japan and I've learned so much about the tools around me from your blog (I don't know anyone else who draws comics in my daily life). I used to use tippex (like wite-out I think) until I recently managed to get some Pro White and have found it a bit of a nightmare so far. I have tried inking over the Pro White with a dip pen and the ink suddenly poured out, so I have a larger lump of ink than I want. I must of messed up the consistency? Surely it not supposed to do this?? Rory: It's notoriously difficult to make a dip pen and ink get along. The ink doesn't behave the same way on dried correction fluid as it does on paper. The correction fluid's goal is to be as opaque and durable as possible in as thin a layer as possible, but they don't give much consideration to texture except that it not be actively ink-repellent. To ink over it you need a fairly dry nib, one with hardly any ink on it, a lighter touch than normal, and a slower hand. OK, its good o get a better idea. Its a bit irritating, the ink was perfect when applied over tippex... Although thinking about it a may have had similar problems now and then... More practice needed! Brilliant. I just started searching for white inks because I need it and found this. I will do this immediately and save myself some trial-and-error. what's the difference between this and gouache? I use Maxon white ink and it's good enough for me. You are amazing! Thank you. One rarely gets this simple yet precise explanation for anything. I think if I were still in school (Food Science and Nutrition) an explanation for this would have taken 10X as many words and no helpful pictures. The only thing I can contribute from my background is that level 1 is called "the meniscus." I know, that didn't add anything to the beauty of your explanation. It's just a random bit of knowledge.